Here’s what became of the oddballs. Total oddball use: 186 grams, or about 370 yards. There was some referring to the Knitter’s Handy Book of Patterns for measurements, but otherwise I mostly just winged it, weighing the yarn as I went to make sure I had enough to finish each hat. 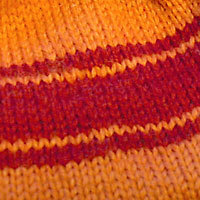 The cabled hat is designed to go with the cable and rib hoodie. 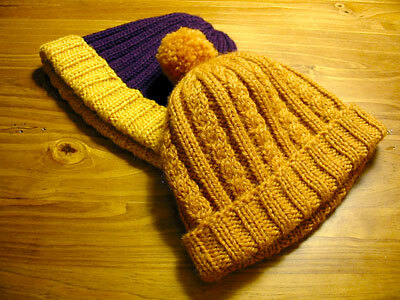 The purple and yellow hat is evidence that I am a bad Wisconsinite, otherwise I would have noticed much, much earlier that I was committing the cardinal sin of making an item in Minnesota Vikings colors. Both the striped hats are hemmed hats. 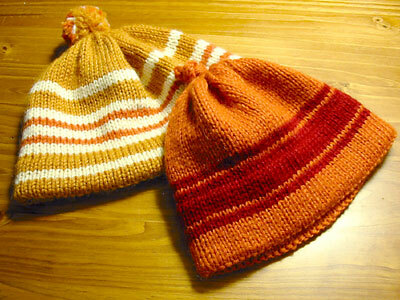 The orange and red one is about 16″ around, as are the two hats above. According to Ann Budd, that makes them fit for infants 0-6 months. The other one is about 18″ around and should fit babies 6-18 months. Pom-poms! I found the “How to Make a Pom-Pom” pdf from Hello Knitty to be the most helpful. For some reason, it surprises me that this procedure produces an actual, round, fluffy pom-pom instead of a neatly tied bundle of yarn. And, in a bit of synergy with Eunny, I tried jogless jogs for the first time. The technique I used is Meg Swansen’s classic jogless jog. Waddya think? The one on the right is the one I did first, and while there’s no real jog, there is some telltale wonkiness at the join line. The one on the left looks more jogless, but there’s still some unevenness that gives away where it is. Any suggestions for how to improve the look? So these hats, along with the cable and rib hoodie, makes five items so far for Afghans for Afghans’s Mother’s Day drive so far. Woo! 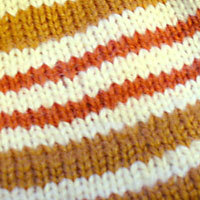 CogKnition posted this on April 13th, 2007 @ 12:21am in Baby Items, Finished Objects, Hats & Mittens, Knitting for Charity | Permalink to "Baby Hat Trick (Plus One)"
Well, if even Eunny doesn’t do make it look perfectly even, there isn’t much hope for us mortals. Ha! (I kid, I kid.) But spirals will always be spirals. And the infant head size…yeah. It kinda reminds me of the fact that I winced through the entirety of a certain scene in Children of Men. Oops, didn’t mean to scream my name there. Caps lock was on. You’re definitely inspiring me to try the jogless jog trick!